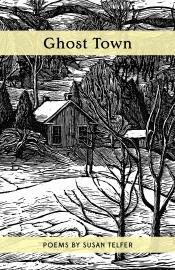 Susan Telfer’s intense poems in Ghost Town are possessed of a wild brilliance all their own. There is a raw, unruly, exhumed energy coming to the surface of these poems, which is the source of their power. This book’s themes are identity, a struggle for self, invention and re-invention, against the undertow of family dysfunction, of ancestral influences, of grief and loss. They are rooted in the west coast, explicitly located on the fault line as well as in dreams. Sometimes poetic forms offer the only way a story can be told.